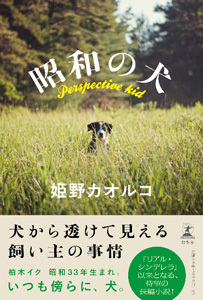 Through the relationship between a woman and a series of pet dogs, this novel portrays the ups and downs of life for the average Japanese person over some four decades from the early 1960s. In eight chapters, the narrative follows protagonist Iku Kashiwagi, born in 1958, from age five to 49, portraying the people, dogs, and occasional cat she encounters along the way. It begins with the five-year-old Iku's journey to an old house in the hills outside town, where she is to live with her father Kanae and mother Yuko for the first time. Kanae works at a vocational school where Russian, Chinese, and English are taught, while Yuko is a special-education teacher for children with disabilities, and because of their busy schedules and family circumstances, their daughter has stayed with a series of foster parents until this. Life in her new home is one of considerable privation, with no bath or indoor toilet. The family has a black mongrel named Dong (Chinese for "East") and a cat named Xi (Chinese for "West") as pets?except that both animals are mostly left to run wild. Dong bites Iku, and Xi fails to come along when the family moves to another house. Iku develops the impression, quite the opposite of conventional wisdom, that cats are the loyal ones, and it's dogs who do as they please. Perhaps because he was previously an officer in the Imperial Army and spent ten years in a Soviet internment camp before returning to Japan, Kanae is a domineering father who also suffers mental breakdowns from time to time, and is prone to lashing out at Iku without reason. But in spite of his general surliness, he seems to have a special way with dogs of every kind. His wife Yuko makes no secret of the fact that she is unhappy with her marriage, and is just as overbearing as Kanae in her treatment of Iku. Growing up in an environment where there is virtually no normal communication between parent and child, Iku turns to their dogs as the only other beings she can "talk to." It is after she goes to Tokyo for college that Iku finally begins to open up, as she moves from one rooming house to another and befriends her landlord's dog or some other canine she meets on the street . . . Delving deeply into the relationship between people and their dogs, the author has crafted an outstanding work of entertainment.